Lee Martin has achieved the Euro Offroad Series title double, fourth place in the season finale at the Hudy Racing Arena enough for the Yokomo driver to clinch the 4WD title from previous undefeated 3-time champion Joern Neumann. Having won the 2WD driver title at the previous round in Austria, Martin becomes only the second driver to clinch both titles with Neumann having achieved the feat in the first two seasons of the indoor 1:10 Offroad Championship. 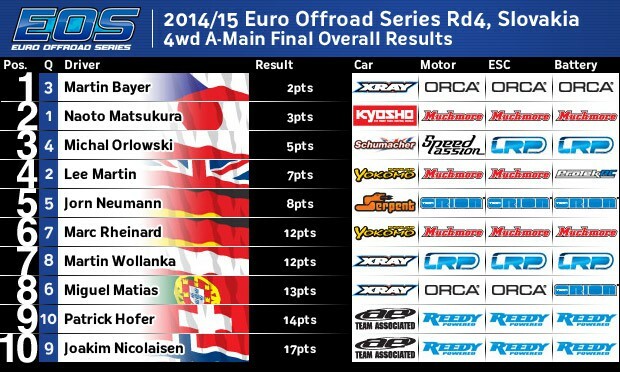 While all the attention was on the title, the fourth & final round of Season #4 would go to Xray’s Martin Bayer, last year’s title runner up claiming his first win of the season ahead of Top Qualifier Naoto Matsukura and Saturday’s 2WD winner Michal Orlowski. 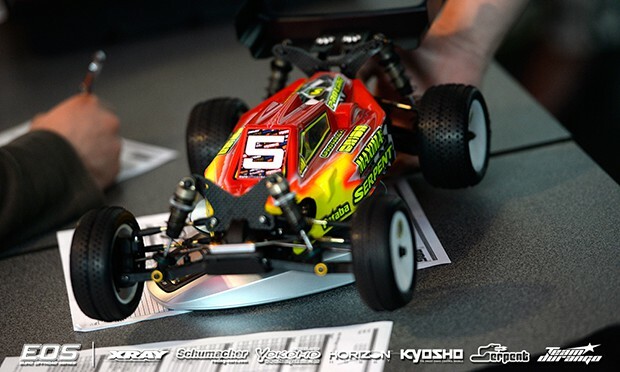 Missing a round of his 1:8 Offroad National Championship to attend the EOS Finale, Martin said ‘we came to race for the title and we achieved are goal’. He continued, ‘we didn’t have the pace to win but we got the vital fourth place so everything worked out’. With the title still open going into the third & final A-Main in Slovakia, the former European Champion would get caught up in an error by Matsukura that dropped him to 5th but said he knew even if Neumann could get up to third, leaving them with the same counting results, it was going to be impossible for him to take the tie break due to slow A2 race time. He also said he knew if Bayer & Matsukura got out front they wouldn’t be caught adding ‘Michal did a good job staying in front of him (Neumann)’ in third. 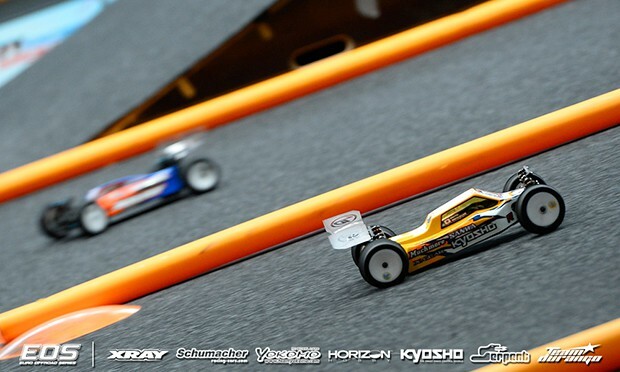 Pleased to be the first driver to beat Neumann to the 4WD title he said it was ‘not a bad second season with Yokomo or first season one with Muchmore’. ‘More was not possible’, that was how Neumann summed up his title defeat. Making the switch from Durango, a team with which he has enjoyed all his EOS success, half way through the series he said changing to a new team was always going to add to the challenge of retaining a fourth title. Still the championship’s most successful driver in terms of titles and race wins, he said ‘hopefully we can develop our cars and come back stronger next year and take the double’. Delighted to give Xray a home win again, having won both 2WD & 4WD at the Hudy Racing Arena last season, Bayer said going into A3 he had nothing to lose. With a 2nd and win the Czech driver said he was already guaranteed 2nd so he went for an aggressive start. Quickly getting passed second place starter Martin, Bayer immediately was able to run with Matsukura. Just trying to ‘keep the pressure on and see what happens’, the Czech ace got his mistake after just a minute when the Kyosho driver traction rolled. 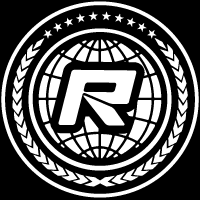 In front and an attempt by Matsukura to come back at him leading to another mistake, Bayer said he just drove the rest of the race trying to keep his XB4 on four wheels. 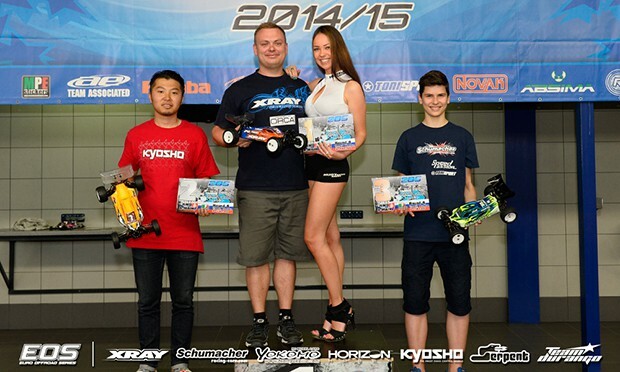 Securing third overall in the 2014/15 Championship, Bayer’s third ever EOS win marks the first international offroad win for his electrics sponsor ORCA. 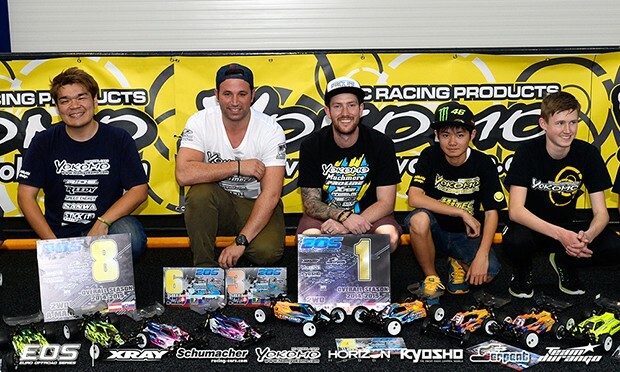 Having looked like a win on his Kyosho debut outing in the EOS was going to be just a formality following his convincing qualifying performance and A1 win, Matsukura said he simply got caught out by traction roll. Setting the fastest lap of the race as he tried to get back passed Bayer he said a second mistake made that impossible. Commenting that Bayer’s buggy looked more easy to drive the 21-year-old declared he would be back next season to finish the job. ‘Surprised’, that was Orlowski’s reaction to his podium finish. 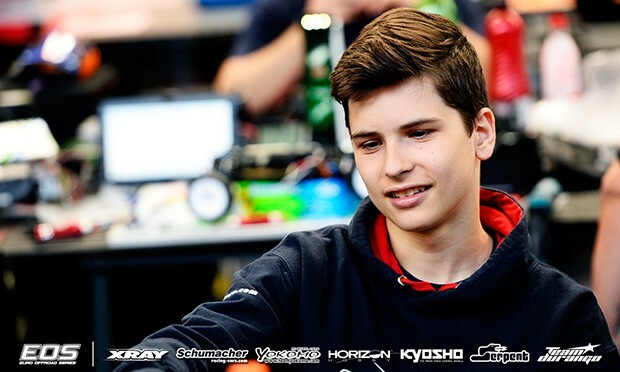 Equalling his best previous 4WD result, 3rd in Wels last season, and giving Schumacher their first 4WD podium, the 13-year-old said he got lucky in the finals while others crashed up front but he was happy to take the result. Claiming his first overall EOS win 24-hours earlier, he said ‘overall it was a super weekend’ but going forward ‘we need to work on our 4WD (car) for high traction’. 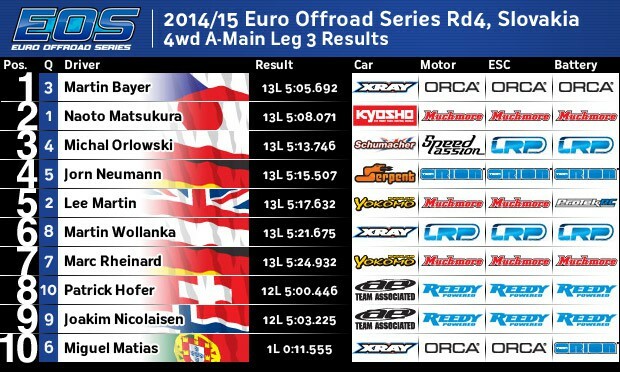 In the overall standings Orlowski ends the season fourth.